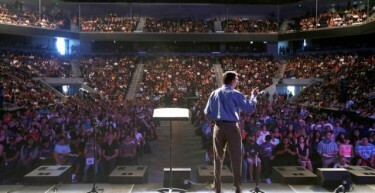 Brian Mueller, GCU’s president and CEO, addresses a packed first Chapel of the school year on Monday. 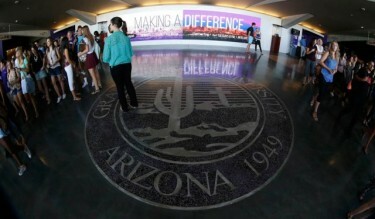 When Grand Canyon University President/CEO Brian Mueller began Chapel Monday morning by sharing his heartfelt talk two days earlier with a student-turned-employee named “Jenna,” Jenna Pearson was as surprised as anyone. But it shouldn’t have been surprising to anyone who knows her that she has such strong feelings about bringing some sunshine to an ever-darkening world and that what she told Mueller would provide such a perfect opener for the “Making a Difference” theme in Chapel this fall. 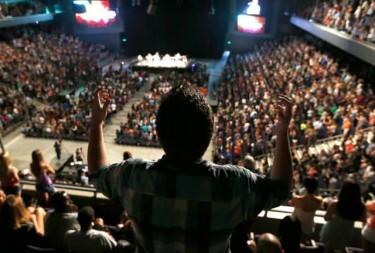 The occasion was a big moment for the University — the largest crowd (6,500) ever for Chapel in the newly expanded Arena. Anyone who doubts the ability of a Christian university to get students to come voluntarily to a Chapel service needed to see the packed floor seating and lower bowl and the nearly full upper deck. An estimated 6,500 students, staff and community members attended Chapel Monday in the newly expanded GCU Arena. Before he drew from the story of Joseph’s ups and downs, which begins in chapter 37 of the book of Genesis, and laid out his five-point plan for the University, Mueller talked about his Saturday morning business meeting with Pearson on the second floor of the Student Union. Pearson said she felt upset when she woke up that morning and couldn’t help but dwell on so many world events spinning out of control. “I really feel like God laid it in my heart, how broken this world really is,” she said. When she met with Mueller, the former GCU basketball player, now a University admissions representative, couldn’t help but share those feelings after he started asking her questions about what’s happening on campus. She inspired Mueller, who also spoke of a theme that came up at the Switchfoot concert Saturday night — the need to have “powerful imaginations” in the mission to make the world a better place. “Your imagination is a lot more than you think it is,” he told Monday’s Chapel audience. In many ways, Pearson is a good example for Mueller’s vision of a service-oriented University turning out students who make the best of whatever jobs they get after graduating. (Most people who do great things in the world started at the bottom,” he said.) She majored in Exercise Science but now envisions a possible future in communications, and she’s starting out by taking the GCU message to area high schools in the hope of giving students the focus they need. The 2014-15 Chapel theme is “Making a Difference,” and the campus community at-large is being encouraged to do just that. Mueller has made that his mission as well, of course. He talked of how nearby Alhambra High School has gone from an F-rated school to one that is, he said, 10 points from a B rating. His other goals are to further the University’s focus on its new STEM-related curriculum, make the local neighborhood safer, create local jobs and partner with Habitat for Humanity to rebuild at least 700 homes. “We can do so much more together,” Mueller said in closing, “but you’re a catalyst. This is the catalyst. Look around this room and think that five years ago we had Chapel in Ethington Theatre with a hundred people in it and today we come in here and the Arena is filled. It’s an example of what God can do. “The greatest witness that you can make is how you go about your work the next eight months — when you go about your work with a sincerity and an effort to do the best that you can, to give the best that you can, to not settle for less than you’re capable of. Music, message and the masses made the first Chapel a special time. Back in the north end of the Arena, Bob Machen looked on in wonderment at the expansion project he had overseen as the University’s senior vice president of campus development. But the expansion of Chapel left him just as much in awe. It was a look-at-us-now moment that should be properly catalogued and filed away as a milestone in the University’s history. Yes, the world is broken in many ways, but “Making a Difference” starts one step at a time — sometimes in a heartfelt talk on a Saturday morning. It’s stories like this that make me proud to be a part of the GCU Community! It is these kind of stories that fill my heart with joy and my soul with hope. I thank GOD that HE led me to GCU. There are many (and expanding) options when it come to continuing one’s higher education….There are many times fewer that can retell the kinds of stories that bring true hope and encouragement. Thank you Mr. Mueller. Thank you GCU family. May GOD continue to bless and guide each of you as you go about the work of making the world a little better place.